Six months ago I and my colleagues worked in Kyrgyzstan. The mass media refer to the events, which brought us there, as "Osh massacre" while the official sources prefer to delicately name it as "interethnic clashes". In fact these were very large-scale and very brutal pogroms, Kyrgyz slaughtered local Uzbeks. It is not right to say that vice versa (Uzbeks slaughtered Kyrgyz) did not take place at all, but the scale is not comparable. At least I had such impression as a result of two business trips to Osh this summer. I am neither Uzbek nor Kyrgyz and I can claim to be unbiased. Of course we tried to stay political correct, but the conversations within limited circle always had some flavor: "This is wild. Well, this is Asia". Six months later the arrogance of "white man" was totally discredited because Russians started slaughtering Caucasians in Moscow. Here, I cannot really stay unbiased because I am a Caucasian myself. I will not try to find out who is guilty and who is not, but will give few comparative details. Kyrgyz have not liked Uzbeks since long ago. Today’s "Osh massacre" is not the only precedent: there were pogroms twenty years ago, albeit not as extensive. This is not the only case in Moscow either; people already devastated the markets with foreign traders, exploded the markets with foreign traders, time to time slaughtered the foreigners in the streets and subway. The scale was different though. Generally speaking, in this matter Moscow totally looks like Osh. Why do not Kyrgyz like Uzbek minority? The reason is that Uzbeks claim to be full-fledged citizens of Kyrgyzstan, want Uzbek language to gain some status, want the number of Uzbek deputies in the parliament to reflect the real figure of Uzbeks in the republic, want to get employed in the state authorities as well as Kyrgyz. Kyrgyz view this as the expansion of aliens; ultimately, the name of the country is Kyrgyzstan and this is already the reason why Uzbeks must know their place. The fact that the cities of southern Kyrgyzstan have been populated by Uzbeks since Pea king period is disregarded. Why do not Russians like Caucasians? Language, deputies, labor discrimination have nothing to do in this case; however, delving more, you will find the same expansion as the problem. Russian Muscovites, for example, do not like that Caucasians believe they have a right to dance lezginka in the downtown Moscow; the fact that there are the citizens is ignored. Is the dislike of Kyrgyz in relation to Uzbeks only enough to start "Osh massacre"? No! The pogroms took place when the question of power was being discussed; when the south, supporting former President Kurmanbek Bakiev, was not ready to admit the power of northerners, headed by Roza Otunbaeva. When the supporters of Bakiev were driven out of power, we had the "interethnic clashes", proving the incapacity of Otunbaeva’s team to rule the country. Meanwhile, the pre-election years in coming up in Russia and entire political establishment is busy with discussing the strengthening collapse in the Medvedev-Putin tandem while Medvedev-appointed Mr. Sobyanin replaced Mr. Luzhkov, the teammate of Mr. Putin. In Kyrgyzstan, the law enforcement structures, to say the least, let the pogroms happen, to say maximum, facilitated them, allowing the pogrom-makers to take over the weapons, armor and sometimes joining the army of pogrom-makers. Did it happen because Kyrgyz law enforcement officers are the nationalists as well as Kyrgyz pogrom-makers? Not only. In the last several years, the Interior Ministry in south Kyrgyzstan has been managed only by the supporters of Bakiev; for them, any sign of weakening Otunbaeva’s power opened the opportunity to keep their positions. What happened in Moscow? Three days before the pogroms the Spartak fans marched over the Leningrad highway, shouting "Russia for Russians". What was done by the Moscow police in this period? It did not prevent this although it had all reasons to stop unsanctioned march; if some other "objectors" marched over the Leningrad highway it would stop the meeting, but not this time. Next day, Victor Biryukov, the head of Moscow interior affairs department press-service, informed that "the Spartak fans built very good relations with special police force". Few thousands were given unambiguous signal: "You can do it!" In the next three days fans and nationalists openly the discussed the meeting by the Kremlin time in the forums and social networks. Browsing through Internet it was clear that the Manezh Square will gather few thousand people on Saturday. Why? What for? "Russia for Russians" march was not clear enough?! Few years ago, on the eve of the G8 summit in Saint Petersburg there was a wave of preventive arrests of activists, practicing anti-globalist ideas. The summit did not have accidents. Obviously, this is not the case this time. As a result, the pogrom took place. With very few exceptions the interference of police was limited by arguing not to finish those, who could not move. This is not the secret that nationalism in the Interior Ministry and other law enforcement structures is non-official ideology; is this the only reason why it all happened? No. Our situation is the same as in Kyrgyzstan unless somebody does not know that collapsing tandem consists of liberal and security man. There is a difference between connivance and organization. In the south of Kyrgyzstan the authorities were not limited by the connivance. One detained Uzbek admitted that he had been involved as instigator by the instruction of Osh mayor Melisbek Myrzakmatov (the supporter of Bakiev). Meanwhile, Valery Zaborovskiy, the activist of pro-Kremlin Molodaya Rossiya movement, was detained at the Manezh square. Ultimately, who’s fault is this? In Kyrgyzstan the authorities are still hunting for the pogrom-makers. Kyrgyz police officers are hunting, Kyrgyz adjudicators are judging; is it a surprise only ethic Uzbeks are found guilty? The reason for riots here became the fight between Dagestani and fans where one of the fans was murdered. The murderer was arrested while the other participants of the incident were not detained. Such a soft move is possibly explained by the bribe that served as the trigger. It also has to be mentioned that not the investigators, which showed hardly explainable humanism, were assaulted. After the pogroms the authorities decided "to correct the mistakes" and now are looking for missing Dagestani. What about pogrom makers? Little over 60 people were detained and allowed to leave. The conclusion is that only Caucasians bear the responsibility? Just as it is in Kyrgyzstan. 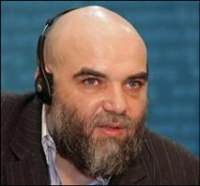 Orkhan Jemal – journalist, military correspondent, political observer, expert on Caucasus and Central Asia. He was born and lives in Moscow. The article was prepared specially for Ferghana.